S Irenaeus: "avoid foolish and ignorant debates...correcting opponents with kindness"
Particular Churches are fully catholic through their communion with one of them, the Church of Rome "which presides in charity." "For with this church, by reason of its pre-eminence, the whole Church, that is the faithful everywhere, must necessarily be in accord." (St Irenaeus) Indeed, "from the incarnate Word's descent to us, all Christian churches everywhere have held and hold the great Church that is here [at Rome] to be their only basis and foundation since, according to the Savior's promise, the gates of hell have never prevailed against her." S Cyril of Alexandria. "Proclaim the word"
... the time will come when people will not tolerate sound doctrine. People love theater and love to be entertained. They also like to be surprised. One of the most popular shows on TV invites people from all walks of life to display their talent in front of three judges. If they prove to have a skill worthy of the stage they get an opportunity to advance in the competition for a chance at a career in show business. One appeal of the show seems to be the element of suspense as the audience experiences a role in the discovery of a new and exciting talent for singing, dancing or other means of entertainment. The show also affirms the nearly limitless ingenuity and resourcefulness of the human person, created by God with great dignity and potential. The best and most captivating entrance is a humble one followed by the revelation of awe-inspiring greatness. Recently an unassuming young man on the show about which I have been speaking wowed the audience and had them on their feet cheering with his tremendous dancing after a very simple and self-effacing introduction. His talent far outweighed his sense of self-importance and endeared him all the more to the audience. No one can outdo God. And when it comes to God's presence in our lives, no one is greater. In the gift of Himself in every Mass, truly present as He is in the Eucharist, no one outdoes God in humility for in this way the greatest becomes so small so as to be the least among us, inviting us to receive Him without fear. God becomes most small, the least, in the death of Christ upon the Cross, whereby He made Himself the suffering Servant for the redemption all of humanity. His humility as Savior is also made present for us again each time we celebrate, worship and receive Him in His Eucharist. God's way of acting can also serve as a stumbling block for us, causing a kind of disbelief or scandal. It runs completely contrary to our human way of thinking that someone great would willingly become so small as to risk rejection or indifference. God's greatness in loving is evident in that He gives us what we most need in the Eucharist. We are sinners in need of redemption. With the exception of the case of mortal sin which must be forgiven sacramentally in confession to a priest, we should receive this Sacrament as often as possible for the forgiveness of our venial sins. In the Eucharist, God truly present inspires us to love Him. And the deep love invisibly in our hearts is naturally expressed visibly by the adoration of our bodies. We worship God truly present in the Eucharist by our posture: our gestures of genuflection and bowing. Love seeks union. God uses his infinite power in the Eucharist to make Himself one with us in the perfect union which satisfies the need of the one who loves to be one with the beloved. This "greatest show on earth", the act of God who gives all His power to us who are powerless on our own in the battle against sin, is not done for applause. God's unforgettable performance on the altars of our churches everywhere is given because of Divine Love: God gives Himself under the signs of bread and wine to save us from our sins! Saturday, Wk 12: "that you may refresh yourselves"
"If you knew the gift of God!" The wonder of prayer is revealed beside the well where we come seeking water: there, Christ comes to meet every human being. It is he who first seeks us and asks us for a drink. Jesus thirsts; his asking arises from the depths of God's desire for us. Whether we realize it or not, prayer is the encounter of God's thirst with ours. God thirsts that we may thirst for him. Nativity of St John the Baptist: "I am too young"
"To whomever I send you, you shall go"
Jesus is the Father's Emissary. From the beginning of his ministry, he "called to him those whom he desired; . . . . And he appointed twelve, whom also he named apostles, to be with him, and to be sent out to preach." From then on, they would also be his "emissaries" (Greek apostoloi). In them, Christ continues his own mission: "As the Father has sent me, even so I send you." The apostles' ministry is the continuation of his mission; Jesus said to the Twelve: "he who receives you receives me." Thursday, Wk 12: "He taught them"
as one having authority, and not as their scribes. The Jewish people and their spiritual leaders viewed Jesus as a rabbi. He often argued within the framework of rabbinical interpretation of the Law. Yet Jesus could not help but offend the teachers of the Law, for he was not content to propose his interpretation alongside theirs but taught the people "as one who had authority, and not as their scribes". In Jesus, the same Word of God that had resounded on Mount Sinai to give the written Law to Moses, made itself heard anew on the Mount of the Beatitudes. Jesus did not abolish the Law but fulfilled it by giving its ultimate interpretation in a divine way: "You have heard that it was said to the men of old. . . But I say to you. . ." With this same divine authority, he disavowed certain human traditions of the Pharisees that were "making void the word of God". Ss John Fisher and Thomas More: “Beware of false prophets"
The Holy Spirit is the protagonist, "the principal agent of the whole of the Church's mission." It is he who leads the Church on her missionary paths. "This mission continues and, in the course of history, unfolds the mission of Christ, who was sent to evangelize the poor; so the Church, urged on by the Spirit of Christ, must walk the road Christ himself walked, a way of poverty and obedience, of service and self-sacrifice even to death, a death from which he emerged victorious by his resurrection." So it is that "the blood of martyrs is the seed of Christians." S Aloysius Gonzaga. "How narrow the gate"
Monday, Week 12: “Stop judging"
Everyone has made a wrong decision at some point in their life, and everyone can speak about the suffering or pain caused by bad decisions. What, on the other hand, about the suffering or pain that is caused by doing the right thing? How often can we say that we suffered personally and willingly for doing right? Or that we chose to do what was right and good with foreknowledge of the cost to ourselves? I recently spoke with a father who is suffering for doing the right thing. This man is a divorced father who fell in love with a divorced woman, who also has children, and they subsequently decided to move in together. After some time with this arrangement, however, the man decided that his sense of sin in living with a woman to whom he is not married demanded that he do the right thing: follow his conscience and break up. Now they are living separately and the relationship has changed to the point where their future together is uncertain. This man rejected a sinful relationship that simulated the spousal love he rightly seeks in order to choose faithfulness to his vocation as a father and to avoid scandal as a Godly example for his children. Shouldn't someone feel good if they have done a good thing? Yes. But the reality of sin and human nature means that the right and the good will sometimes be opposed, even by people we love the most. Opposition can bring the pain of internal conflict even for those with a clear conscience. Our heavenly Father is the best of fathers: He always gives us what we need no matter the cost to Himself. "He gave His only Son" because that is precisely what we needed, mired in sin and in need of salvation as we were after the sin of our first father, Adam. On this Father's Day we rightly celebrate the selfless and heroic love of all our fathers on earth. But we also for that reason rightly look to the Father in heaven, He from whom all fatherhood on earth takes its name. Jesus Christ, the only Son, is the one who perfectly reveals the love of the Father. On this Solemnity of the Most Holy Trinity we cannot omit mention of the Holy Spirit, who together with the Father and the Son, is one God. 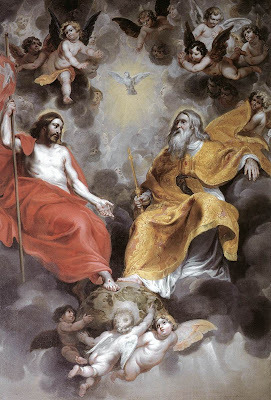 The Holy Spirit continually ushers us into the life of God, whose inner reality is an ineffable mystery which we try to touch and to understand with the word "Trinity". "The love of the Father, the grace of the Son and the fellowship of the Holy Spirit be with you always" to choose what is good no matter the cost in this world which is passing away. Saturday, Wk 11: "grace is sufficient"
... power is made perfect in weakness. Friday, Wk 11: "many boast according to the flesh"
"The flesh is the hinge of salvation" (Tertullian, De res. 8, 2: PL 2, 852). We believe in God who is creator of the flesh; we believe in the Word made flesh in order to redeem the flesh; we believe in the resurrection of the flesh, the fulfillment of both the creation and the redemption of the flesh. Thursday, Wk 11: "I betrothed you"
... to present you as a chaste virgin to Christ. This is the whole Christ, head and body, one formed from many . . . whether the head or members speak, it is Christ who speaks. He speaks in his role as the head (ex persona capitis) and in his role as body (ex persona corporis). What does this mean? "The two will become one flesh. This is a great mystery, and I am applying it to Christ and the Church." And the Lord himself says in the Gospel: "So they are no longer two, but one flesh." They are, in fact, two different persons, yet they are one in the conjugal union, . 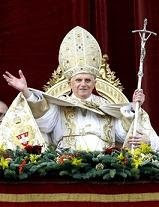 . . as head, he calls himself the bridegroom, as body, he calls himself "bride." Tuesday, Wk 11: "love your enemies"
Individualism is a clear and present danger for individuals. We were made for community, to be with others, because we were made for the love that only others can give us. The trend of cutting oneself off from others through misuse of PDAs, phones, MP3 players and the great assortment of other electronic gadgets has become widespread. Thoughtless use of these devices during conversations hampers communication and sometimes offends those we love. The Holy Spirit is the source of love and Pentecost was the moment the Holy Spirit was first given. This happened in the midst of the people gathered together to pray as we are doing here and now. The Holy Spirit was given to the community first: "They were all together in one place ... And they were all filled with the Holy Spirit." 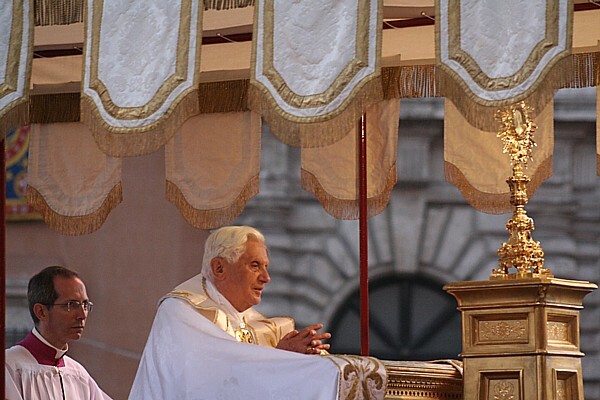 Only through and because of the gift to the Church as a whole is the Holy Spirit also a gift to individuals as part of the community: God works to build us up as individuals in and through the love of the Holy Spirit we discover living and active in the Church, especially at holy Mass. The Scriptures tell us that the Church is the bride of Christ. As a matter of fact, this image is given in the book of Revelation through a prayer which calls out to the Lord: "The Spirit and the Bride say, 'Come'!" But before the Church could call upon the name of the Lord Jesus, the gift of the Spirit was necessary, to give her the power of prayer which is a grace, a gift from God. The primary moment of prayer is the liturgy, the work of God's people who worship together, particularly at holy Mass. The Holy Spirit works in us to make us sons and daughters of the Church. Saturday morning I was “together with the Church in one place” as I attended the ordination of three new transitional deacons for our Archdiocese. I rejoiced to be present as the Holy Spirit used the episcopal ministry of our Cardinal to descend upon three men and create of them three new sons to serve the Church in love all their lives so that the Word and Sacrament of the Lord will work to save many souls. The Archbishop, as Father of our family of faith, brings increase and growth within the a family in his vocation as spiritual father for the whole family of the Church of Washington. The Holy Spirit once again came alive and active with Divine power to change three young men sacramentally into servants at a deeper level of their being for the sake of the good of the whole Church. Only because they moved beyond their individual needs and wants did these young men become capable of the great joy that becomes possible only by forgetting self for the sake of others. Each of us as baptized members of the Lord's body are called also to this joy in keeping with our baptism. Each family of mother, father and children, is a domestic Church. The Holy Spirit is sent also to build up the faith and worship which continues throughout the week in each home which is a household of Faith that each member might flourish in grace and grow toward the life of heaven. 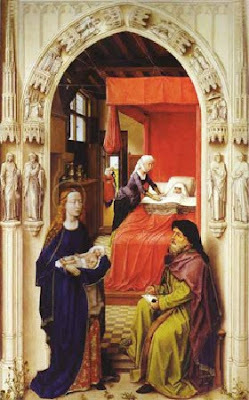 Mothers and fathers say "yes" to God by bringing the great blessing of new children into the world and then say "yes" again by offering their children at the baptismal font to the Father, Son and Holy Spirit so that they will have supernatural life through the sacrament made possible by the Holy Spirit. That life of the Holy Spirit must truly be worthy of the name of "life": one which continues and grows in every circumstance. The love of families overcomes the tyranny and alienation of individualism as brothers and sisters, mothers and fathers practice giving the gift of presence by putting aside distractions for the sake of enjoying time together, in particular on Sunday by avoiding unnecessary work or shopping. The family prays together in one place, in the domestic church of the home and here at Mass, and in other ways, puts overcomes individualism, putting aside sources of virtual reality, in order to be nourished by the real persons and events before them. When we invite the unifying power of Holy Spirit into our midst through heartfelt and sincere prayer in common, walls of division are broken down and hearts and minds can be opened to one another. The family practices selfless love as the fruit of prayer through patience, listening, helping and serving. Thus the Holy Spirit is given again and again to the family, the worship of the domestic Church which abides in faith, hope and love. Saturday, Easter VII: "they laid hands on them"
... and sent them off. To fulfill their exalted mission, "the apostles were endowed by Christ with a special outpouring of the Holy Spirit coming upon them, and by the imposition of hands they passed on to their auxiliaries the gift of the Spirit, which is transmitted down to our day through episcopal consecration." Individualism is a modern threat for individuals. We were made for community, to be with others, because we were made for the love that only others can give us. The trend to cut oneself off from others through PDAs, phones, MP3 players and the assortment of electronic gadgets has become widespread. Also, the risky behavior of sending explicit images over the internet because of a lack of pespective which is a symptom of overdependence on these items for emotional needs has destroyed careers and threatened marriages. Thoughtless use of these devices during conversations hampers communication and sometimes offends those we love. The Holy Spirit is the giver of love and communion. 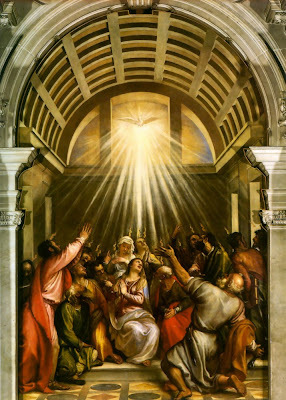 Pentecost was the moment the Holy Spirit was first given to the Church. And it happened in the midst of the people gathered together to pray as we are here and now. The Holy Spirit was goven to the community first, and then only after that to individuals as part of the community. "They were all together in one place ... And they were all filled with the Holy Spirit." The Scriptures tell us that the Church is the bride of Christ. As a matter of fact, this image is given in the book of Revelation through a prayer which calls out to the Lord: "The Spirit and the Bride say, "Come"! But before the Church could call upon the name of the Lord Jesus, the gift of the Spirit was necessary, to give her the power of prayer which is a grace, a gift from God. The primary moment of prayer is the liturgy, the work of God's people who worship together, particularly at holy Mass. Friday, Easter VII: "do you love me "
St Ephrem the Deacon: "O LORD"
Wednesday, Easter VII: "Keep watch"
... the Holy Spirit has appointed you overseers. Tuesday, Easter VII: "this is eternal life"
... that they should know you, the only true God, and the one whom you sent, Jesus Christ. What happens far away impacts each one of us here and now. Images of tornadoes, floods and other disasters are almost immediately available to the curious through telephones and the internet. We gain powerful impressions of their size and scope through the pictures of damaged homes and land, and most tragically, lost lives. With all the data that is available to us about these and other events and people in our world, what can often be lacking is the process of meditating on the meaning of these events. We were made to think and to seek understanding about our world and ourselves and without this process our humanity is incomplete. The sheer size and constant flood of the tsunami of images and news reports tends to prevent the needed process of meditating on the import and meaning of these things for us personally, thereby allowing us to move beyond our first instinctive fears aroused by these disasters toward a more serene sense of resolution. Today we celebrate the Ascension of the Lord, an event that takes Him far away from us, to the highest heavens and to the "right hand of the Father". We could stand around in wonderment like the Apostles did in amazement at this cosmic and awe-inspiring event. We could continue to gaze longingly toward the heavens. But it is better for us if we take the advice of the angels and get busy about the work we are given, to be witnesses in the power Christ sends, thus looking forward to His coming again in power and glory when he "will return in the same way as you have seen him going into heaven". 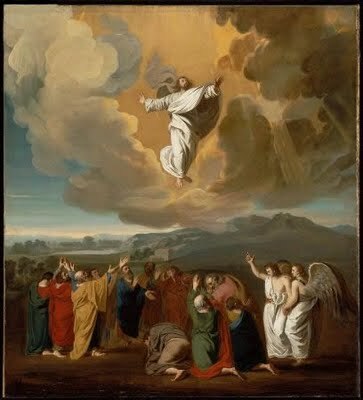 How do we "process" this amazing event, moving beyond the news report in today's Gospel about our Lord's glorious Ascension, as wonderful and awe-inspiring as it is, and discover its true importance for us? This is necessary if we are to have a share in His glory which is manifested in the mystery of His return to the right hand of the Father. You are here today, in this liturgy of the holy Mass, that you might enter into a deeper meditation upon the mysteries of faith and thus gain insight and understanding "through the Church, which is his body, the fullness of the one who fills all things in every way." This fullness is above all of love, for just as no body can go on living without a heart, so the Body of Christ must draw its lifeblood from the heart of Christ, infinite in divine Love. First we are promised: "you will receive power". This power is given through the sacramental life, at the hands of our bishops and priests. How do we receive power? First, through the forgiveness of sins. The power given to the Apostles was for the sake of forgiving our sins, particularly through the Sacrament of Confession. Second we are promised: "You will be my witnesses". When we proclaim the Faith through our actions we invite others to take the risk of believing. Handing on the faith through the witness of lives filled with God's mercy is the calling of a disciple of the Lord who is now seated at the right hand of the Father to intercede for His Church as the source of salvation for the world. We are sent: "Go, therefore, and make disciples of all nations". We cannot give what we do not have. Before making disciples of others we must become disciples ourselves. The gift of the Eucharist is the fulfillment of the Lord's promise that we will "receive power". When we receive Him in a state of grace, that is with all of our sins forgiven through His power in Baptism and Confession, and with adoration and love, we grow in the grace of loving and obedient discipleship. You ask and do not receive, because you ask wrongly, to spend it on your passions." If we ask with a divided heart, we are "adulterers"; God cannot answer us, for he desires our well-being, our life. "Or do you suppose that it is in vain that the scripture says, 'He yearns jealously over the spirit which he has made to dwell in us?'" That our God is "jealous" for us is the sign of how true his love is. If we enter into the desire of his Spirit, we shall be heard. Do not be troubled if you do not immediately receive from God what you ask him; for he desires to do something even greater for you, while you cling to him in prayer. God wills that our desire should be exercised in prayer, that we may be able to receive what he is prepared to give. 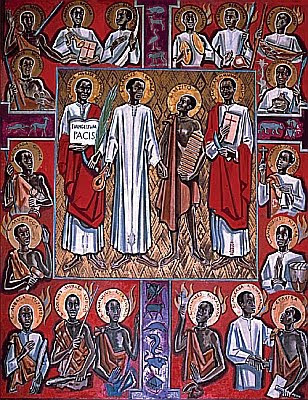 S Charles Lwanga and companions, martyrs of Uganda: "It was my choice to die"
... at the hands of men with the God-given hope of being restored to life by Him. The King of the universe will raise us up to an everlasting renewal of life, because we have died for his laws. One cannot but choose to die at the hands of men and to cherish the hope that God gives of being raised again by him.